The proprietor’s policy on outdoor baths is that they aren’t outdoor baths if the sky is obscured. That’s why we don’t install roofs to obstruct the view. On clear days, you can see the blue sky by day and the stars at night. 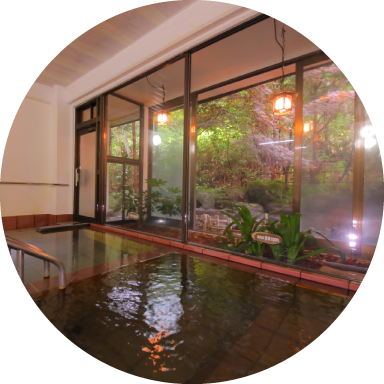 We also offer other authentic hot springs, including one that is safe to drink. This outdoor bath is our pride and joy and is where the name of the inn comes from. Accessible from within the men’s and women’s indoor baths at a short distance and usable by most. The proprietor’s policy on outdoor baths is that they aren’t outdoor baths if the sky is obscured. That’s why we don’t install roofs to obstruct the view. On clear days, you can see the blue sky by day and the stars at night. We took rocks used for garden decoration and repurposed them for our baths, so they are already softened and rounded thanks to weathering from wind and rain. 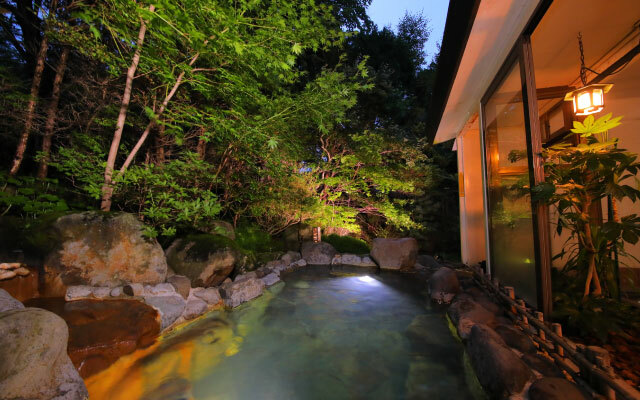 Large and small rocks of different sizes arranged along the outside of the tub allow you to take a seat where you like. We offer two 100% natural at-the-source springs for men and women. 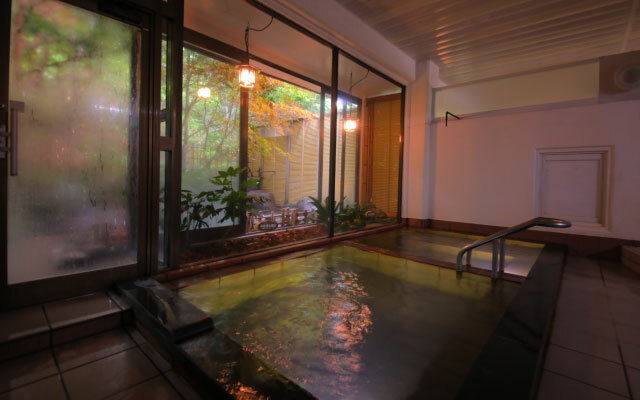 While there are legends that the hot springs in general are good for the body, these rock baths are the hottest of all our baths. The modern body is generally cold year-round, as it is accustomed to air conditioning and various stressors. Therefore, it is best to begin by applying some water to yourself and warming up, then slowly making your way into the bath. Both the men’s and women’s baths feature a rinsing bath and showers. 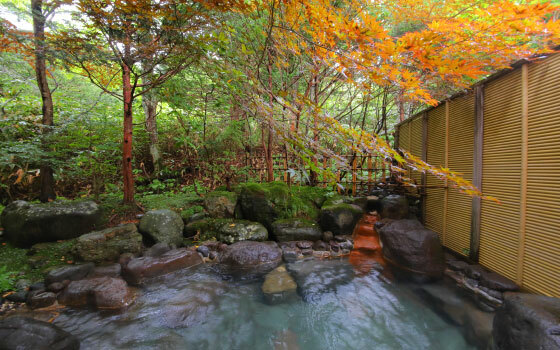 Showers were set up at the request of patrons, but the waters at Karurusu Hot Springs naturally allow soap and shampoo to froth up nicely. Wash yourself from head to toe in the rinsing bath to feel even fresher and warmer when you get in the bath. Note that the showers use heated mineral waters, so it is best to rinse off with the waters from the rinsing bath after bathing. Both the men’s and women’s baths feature an array of shampoo, conditioner, body soap, and block soap. You will also find peeling gels (to slough off dead skin) and pumice. The changing rooms are equipped with hair dryers, hand soap, toner, heel cream, conditioner for use with hair dryers, beauty balm (BB), and more. *All of these products are also for sale in our shop! Don’t hesitate to stop by. 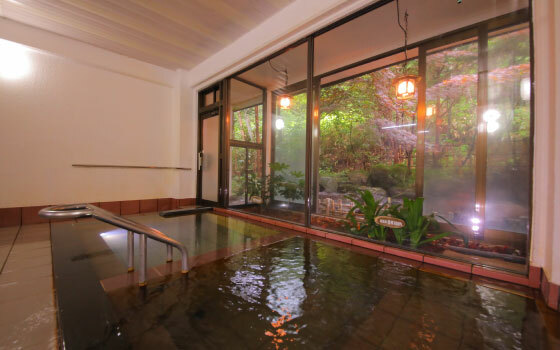 Our hot springs are safe to drink! You will find drinking water fountains installed within the men’s and women’s baths. 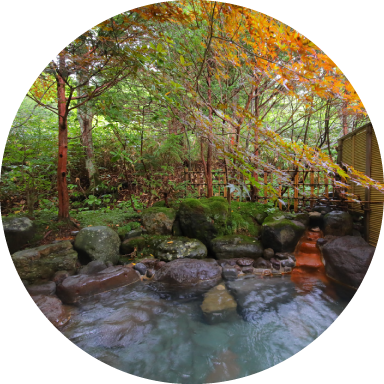 For details, you can refer to the section on the benefits of Karurusu Hot Springs. 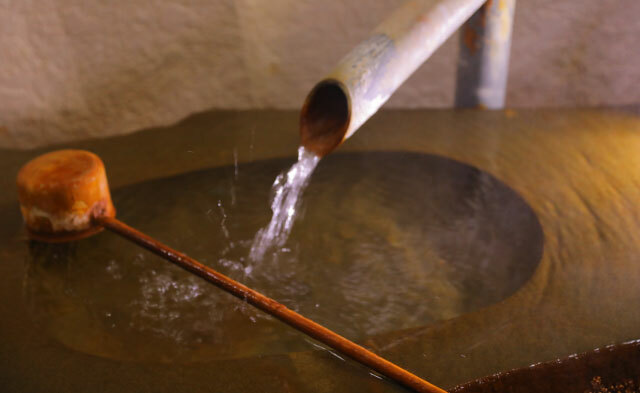 Some of our patrons have said that since they started drinking these waters, they do not experience hangovers. Naturally, continued therapeutic use is best. 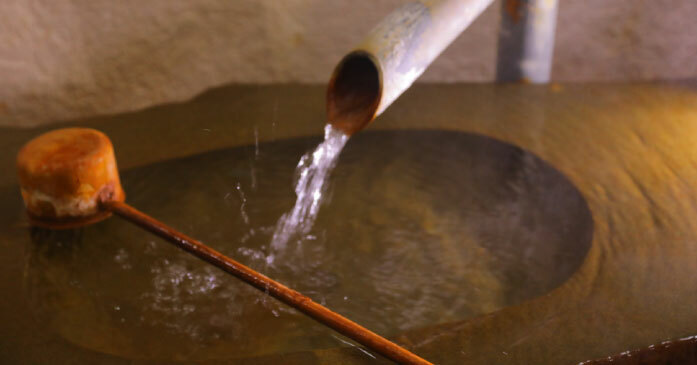 Why not try these "drinkable hot springs" for yourself? We are licensed by the Public Health Office to serve drinking water. 100ml-200ml is recommended for one session and between 200ml-1000ml a day. It is best drunk between thirty minutes to one hour prior to a meal. Avoid drinking between dinner and going to bed. Abundant waters are here for the enjoyment. Experience numerous benefits to body and mind. Hot springs are nature’s blessing! If you have an impairment and are concerned, consult with a doctor first.